Canon Hubert Avril had long been the priest in charge of the Anglican church of St Peter of the Gate in Portmanster Row in London, where he lived in the adjoining rectory. It was there that he had brought his wife ("his dear silly Margaret" as he fondly remembers her) thirty years before. Since her death, he had shared it with lodgers who were also his friends. "The older he grew and the poorer he became, the calmer and more contented appeared his fine gentle face. He was an impossible person in many ways, with an approach to life which was clear-sighted yet slightly off centre, and therefore disconcerting to most of his colleagues. No one feared him, simple people loved and protected him as if he were daft, and he had exasperated more great churchman than any other parson alive .... He believed in miracles and frequently observed them, and nothing astonished him. His imagination was as wild as a small boy's and his faith ultimate. In ordinary life he was, quite frankly, hardly safe out. He was a big man with a great frame, untidy white hair, and the ease of manner of one to whom every stranger is probably due to become an old friend." He was ever ready to help people, and, if necessary, would even pawn his own coat to get money to help them. But he was a shrewd observer and listener, and made a formidable interrogator when his "spectacles were pushed high on his broad forehead, and his eyes, naked and inexorable, looked out sternly from his kindly face", especially as he knew his parish and parishioners inside out. The author claimed that his character was "a sort of portrayal" of her father, although he had never taken holy orders, and the similarity wasn't immediately obvious to other people. 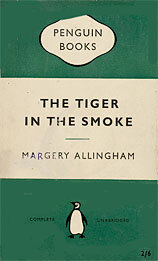 Margery (Louise) Allingham (1904-1966) was born in Ealing in West London, and both her parents were writers. She grew up in a Georgian rectory in a little village near Colchester. She was a pupil at the Perse School in Cambridge then went on to study drama and speech training at the Regent Street Polytechnic in London where she learnt to control a childhood stammer. Her first novel was published when she was still at school, and she also wrote plays. Her first crime novel was published in 1928, and Albert Campion, her favourite detective, first appeared in 1929. He was to be featured in many novels and short stories, spread over four decades. 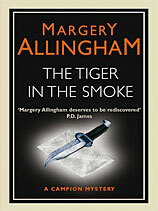 She is still thought of as one of the three great women writers of the "Golden Age" of crime fiction (even if she is seldom read today), and The Tiger in the Smoke (reviewed below) is often described as her best book. She and her husband, Philip Youngman Carter, had lived at D'Arcy House in the Essex village of Tolleshunt D'Arcy, near Maldon in Essex, since 1935, and it is there that most of her books were written. She suffered from severe depression and we know now that her husband Pip even had a child by the well-known journalist Nancy Spain who was then a respected lesbian icon. After her death (from cancer) in 1966, her husband went on to write two more Albert Campion books. He had hoped to write more but died in 1969. 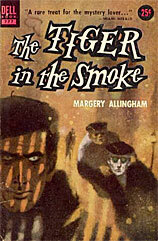 The Tiger in the Smoke is set in fog-filled post-war London (hence its nickname of The Smoke). Twenty-five year old Meg Elginbrodde has been sent a photograph of her supposedly dead husband just when she was about to marry millionaire Geoffrey Levett. Is it possible that her husband had not really been killed in the war? When more photos starts coming in, she turns to her friend, amateur detective Albert Campion, for help. His friend, Divisional Detective Chief Inspector Charles Luke also soon gets involved, but it is her landlord, Canon Hubert Avril (who is Campion's uncle) who really puts them on the trail. Meanwhile, following a vicious murder, Levett is kidnapped by a sinister band of street musicians (who claim to be war veterans) led by an unprepossessing albino called Tiddy Doll. But the real villain who calls himself Jack Havoc, and is a figure of unremitting evil, is eventually identified by Canon Avril as someone who had grown up in his parish. It all leads to an exciting and dramatic conclusion at Ste. Odile near St. Malo in France, where Jack Havoc is convinced that wartime treasure had been hidden. It makes a gripping and often exciting story, even if descriptions of the handicapped street musicians (including a dwarf) do not now sound all that politically correct. But the characters come alive and the story holds the interest throughout. Chief Inspector Luke and Campion are meant to be the detectives, but it is Canon Avril who has the shrewdest grasp of what is happening when a coat from his house is found on a dead body. "You think you can find out who it was, do you, sir?" (Chief Inspector) Luke asks Campion. Luke saw in his eyes "that strange sternness which hitherto he had associated only with the Bench. It's utter ruthlessness shook him once again, as it always did. "Oh yes, said Avril again, "I shall find out." And so he does. When it comes to questioning people, it was obvious that Avril "had either never heard of the Judges' Rules, or considered that in his own family they did not count. Impractical he might be, but as an extractor of the truth he was, as Picot (the police sergeant) was forced to admit, remarkably efficient." In the end, after much deliberation, he even goes off by himself to confront the villainous Jack Havoc although he knows only too well that he is putting his own life at risk. Recommended - although the canon might have been surprised to hear himself described as a detective. The book was made into a film in 1956, with Tony Wright playing Jack Havoc, and a supporting cast that included Donald Sinden, Kenneth Griffith and Gerald Harper. Albert Campion was left out of it! 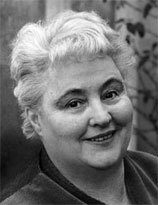 There is an informative Margery Allingham Society site and a useful brief biography on the Wikipedia site, as well as appreciative newspaper articles on the net. There have been some very contrasting cover designs.